Actually written by Greg Muddle. 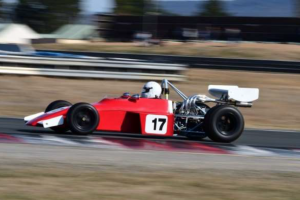 The 2019 NSW State Championship kicked off at Sydney Motorsport Park with the inaugural running of the David Choon Memorial Trophy, in honour of our late friend. David won the first ever state series event under the FRCA banner, and the trophy race is a fitting memorial to a keen competitor. With a valued prize, perfect conditions, and a new season ahead of us, it was disappointing that there wasn’t a larger field of cars, but what the grid lacked in quantity was well made up with quality. Class certainly won through: Graeme Holmes made a welcome return to the winners circle with three race victories; but he had to work hard most of the weekend. In what augurs well for the 2019 season there were several drivers in the mix, making for close and exciting racing. 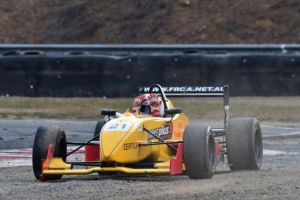 With 2018 Champion Nathan Gotch, and the might of the AGI Sport team, not competing the full season in 2019 it presents a golden opportunity for a number of drivers to challenge for the championship. 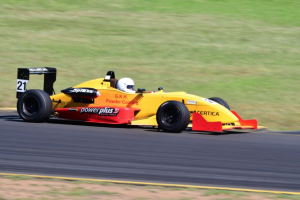 Warm and sunny conditions greeted the drivers, however the newly re-surfaced Sydney Motorsport Park had all the rubber washed away with a wet Friday and overnight storms, so the track produced some relatively slow times. Greg Muddle made the best of the session by putting the old F399 on pole – a nice symmetry in a meeting where we were celebrating our maiden round winner that our maiden pole-sitter returned to the top of the timesheets, with what proved to be the fastest time of the weekend. It should also be noted that this was Greg’s 100th race start with FRCA – his pole position a fitting way to celebrate this significant milestone. Aaron McClintock made it an ‘All-01’ front row, proving that you don’t always need the latest kit to be competitive (note to those thinking about going wings ‘n’ slicks racing – there are some cheap 01’s for sale at the moment, so this could be you). Graeme Holmes wasn’t far behind, making it a 1-2-3 for cars with Opel ‘Holmes-power’ – certainly the best engine around. He was joined on the second-row by Ross McAlpine having a nudie run in the Mygale – an un-liveried car that is, not an un-apparelled driver. At this stage of the weekend Ross was looking a threat. Third row was fought out between the two Dallara ‘04s of Phil Morrow and Lawrence Katsidis, with Phil’s Opel powered car shading the SYDNEY PHOTO BOOTH Renault powered car by the slightest of margins. They were well clear of a slightly disappointed Ron Coath in the Dallara Mercedes F307. Ron having struggled throughout Friday practice with gearbox issues – being unable to get down to the sort of times which he and his car are capable of during this session. Ron was joined on the 4throw by Glenn Lynch in the Dallara Fiat F397. The field was rounded out by our newest competitor, Rob Rowe in the Genesis Offices Dallara Toyota F310. Rob was well short of valuable seat-time but had a respectable first outing and looked good in the car. He was joined at the back of the field by Rob Sviderskas, exercising amazing patience in the wait for new pistons for his Dallara and in the meantime running the Elfin 622 Toyota – which makes very nice noise but it old enough to be a grand-father to some of the other cars in the field. A late afternoon start but still in warm and sunny conditions which were perfect for the spectators. And good for racing too… except for the major engine detonation in the previous race that saw an oil trail from half way down the main straight through to the braking zone for turn 2! When the lights went out Holmes got the jump from the second row, and although Muddle gave up position to McClintock off the line he was able to hold the line into turn 2 to retain second place. From there the three drivers put on 8 laps of pure entertainment, rarely being gapped by more than a few car lengths. Muddle was under serious threat from McClintock, and they changes places several times. Holmes wasn’t getting much respite from this – when Muddle was in second he was challenging down the front straight; when it was McClintock’s turn he was asking questions up the back straight. But Holmes had all the answers. Muddle had the best pace at that stage, but unfortunately the spectacle was interrupted on lap 8 when Muddle was pushing a little hard through turn 5 and ran out of talent – looping the car in front of McClintock who was able to take avoiding action but it cost him a bit of time on Holmes. McClintock managed to narrow the gap lap by lap, but the race was perhaps a lap too short – Holmes holding a winning margin at the flag of less than a tenth of a second. Behind the front cars Morrow made a good start to head McAlpine with Katsidis in close quarters for the first section of the race. McAlpine was expecting the car to ‘come on’ after the first few laps, but unfortunately that never eventuated, later discovering some set-up issues with the rear ride-height which were something of a handicap to performance. So while Morrow pumped out consistent laps a gap opened to McAlpine, who fell into the clutches of Katsidis, the later making his move into 4thplace on lap 10. Coath had a consistent but lonely run in 6thplace, with Rowe not far behind until he had a spin at turn 6 late in the race, eventually finishing a lap down. Sviderskas parked the Elfin early, having issues with getting the car to rev to the required rate; and Lynch failed to get the car off the line (it’s difficult in 3rdgear) and parked himself in the grandstand receiving refreshments from the crowd. Sunday morning saw very similar conditions and we were ready for a repeat of the previous day’s spectacle, albeit with Muddle having to come through the pack to do so. Holmes had the best of the early stages, establishing a lead from McClintock, Katsidis (later penalised for a jump start) and Morrow. The joker in the pack was Rowe who was up to 5th, with Coath following and Lynch giving up a place to Muddle mid-way through the lap. McAlpine had experienced difficulties getting the car away from the dummy grid and consequently was forced to start rear of grid. With Holmes opening a small gap on McClintock the action was further back. Muddle and Coath swapped places twice between turns 14 and 15 on the first lap, before Muddle finally made the move stick on the entry to turn 1. He then rounded up Rowe; followed by was a series of similar turn 1 moves to pass Katsidis and Morrow on the subsequent laps. Coath was not being left behind however – it took a couple of laps but he too passed Rowe, and then Katsidis, before running down Morrow on lap 8. At the front Holmes held a small but comfortable gap on McClintock all the way to the finish, with Muddle unable to make any headway in 3rd. Coath finished strongly in 4th, finding 3 seconds improvement in lap times over Saturday. Morrow was having clutch difficulties and slipped back, allowing Katsidis to move up to 5thin the closing stages. Lynch followed behind Morrow, benefitting from Rowe having had another mishap at turn 6. Sviderskas finished a lap down, still struggling with the Elfin’s rev-range, and McAlpine parked the non-performing Mygale in frustration half-way through the race. Having won the first two races, Holmes was looking for a trifecta in the Trophy Race but McClintock and Muddle again loomed as serious threats. Unfortunately that only lasted as far as the second corner: McClintock having a spin mid-corner and Muddle, already with his hands full down the inside of the corner trying to regain position from Coath, looping his car in avoidance. By the time both of them re-joined their chances were gone. McClintock was able to recover to charge through the field to 3rd but Muddle unfortunately succumbed to a broken rear wing, which was pretty unlucky given there was no contact whatsoever in the incident. While Holmes pedalled away somewhat surprised at his good fortune, there was plenty of action behind him. Coath had the best run though the turn 2 parking lot and established himself ahead of the fast-starting Rowe, with Morrow, Katsidis and Lynch following, and Muddle and McClintock tailing the field at the end of lap 1. Rowe held Katsidis at bay for 5 laps, with Morrow in attendance but increasingly struggling with to get power down due to the continuing clutch issue. On lap 6 Katsidis passed Rowe, and McCintock also started his assault on the mid-field pack, passing Morrow. He gained a further place on the following lap with Rowe having his now customary ‘off’ at turn 6. Holmes cruised to the win with a big margin, with Coath holding onto 2ndby a couple of tenths over the fast finishing McClintock, who had rounded up Katsidis on the final lap. The consistent Lynch finished in 5th, ahead of Rowe and Morrow, who nursed his car to the line. Muddle finished a weekend that had started with some promised with a black flag one lap from home having pitted earlier in the race. 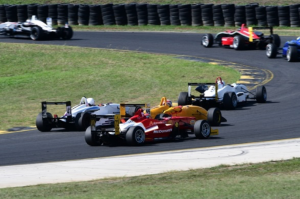 25thand 26thof May– celebrating 25 years of racing at Wakefield Park. For all the 2019 Championship points tables click here. In memory of David Choon. 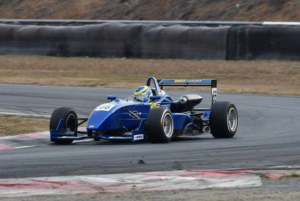 Wakefield Park was the venue for Formula Race Cars’ second appearance of the season in the 2018 NSW State Championship, and Nathan Gotch in the AGI Sport Dallara Renault F307 was able to master the cool conditions to produce another maximum points performance and extend his championship lead. 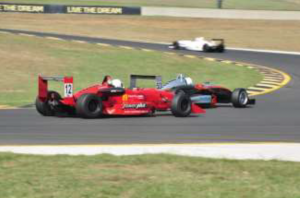 While Gotch was a class above the rest of the Championship field, it was his battle with the non-championship Dallara Honda F311 of Spike Goddard that put some heat in the weekend – a cracker of a race on Saturday afternoon going to Gotch, before Goddard cleaned up on Sunday, with the two trading quickest laps across the weekend. (Wiltec Dallara Opel Spiess F305), Greg Muddle (Dallara Opel Spiess F399) and Ross McAlpine debuting his new ride, the ex-Harvest Mygale Mercedes M-11. 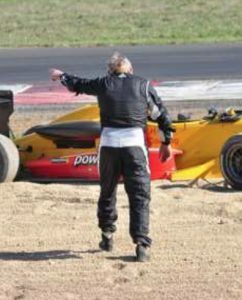 Ten minutes in, and we all got the chance to cool down again courtesy of a red flag when Graeme Holmes (GKH Powdercoating Dallara Opel Spiess F304) found the Turn 2 sand trap, a result of continued brake problems. With some confusing signals in pit-lane leading several competitors back to their carports and quitting the session at that point, those who were actually paying attention had an ideal opportunity to put in three quick laps after the re-start. Gotch’s existing time was already good enough for pole, but he managed to lower that by a further 2 seconds, getting down to the 55.7’s. McAlpine also benefited, diving down into the 58’s and leap-frogging Wilson into third. Behind Wilson, Muddle headed up Andrew Wlodek (Dallara Honda F307) and Lawrence Katsidis (SYDNEY PHOTO BOOTH Dallara Renault F304) who, having put his troubles of the last round behind him, was looking quick. Ron Coath (Dallara Mercedes F307), had brake troubles in the first part of the session, but managed to drive around that and pull out a respectable time in the closing part of the session, which put him ahead of Holmes on the grid. Coath and Holmes just shaded the time of Phil Morrow (Dallara Opel Spiess F303), rounding out the Top 10 but looking quite capable of competing with the cars a couple of rows ahead as they were in a closely bunched group. Glenn Lynch (Eagle Transport Dallara F397 Fiat) was again doing a stellar job in the oldest Dallara in the field, qualifying ahead of Denis Lesslie (Tru Blue Trailers Dallara F302 Renault), who was still coming to terms with the new car, and Rob Sviderskas (Elfin 622) rounding out the field. The lovely Elfin hadn’t been on track for quite some time, and gave away quite a bit in sophistication and speed to the F3 cars, but it was great to have Rob there boosting the numbers – just a great pity that there weren’t a few other older cars out there running around with the Elfin. When the lights went out Goddard got the jump on Gotch and led the field away, with plenty of jockeying for position into Turn 2. Katsidis had a blinder and had his car into 5th outside Muddle as they exited the turn together, which saw Muddle getting on the throttle a little bit earlier than the cold tyres liked, with the result that he turned the car around in the middle of the following pack. Fortunately everyone managed to scatter. Behind Goddard, Gotch was pressing hard, and they were both gapping the following pack of McAlpine, Wilson, Katsidis and Wlodek. Holmes’ woes continued, dropping to the back of the pack, but Morrow’s fortunes were better, and after a steady start he gained a place passing Coath on the second lap. Out front of the pack Goddard and Gotch were steadily dropping their times, into the low 57’s by lap three and into the 56’s a couple of laps later, but they were never more than a few tenths apart. Unfortunately those times put them behind lapped traffic, and at the end of lap 8 Gotch made the most of Goddard’s misfortune, as Goddard was baulked in his run onto the main straight it allowed Gotch to run past into the lead, a position he was able to defend for the final lap to take victory. Although the front two had sprinted away from the pack there was plenty of interest for 3rd, and while McAlpine was able to establish a bit of a gap early on Wilson was strong at the back end of the race, making the most of his opportunities to pass McAlpine on the last lap. Katsidis had chased the pair hard for most of the race, and was only a couple of seconds behind in 5th at the chequered flag. Wlodek had a fairly solitary race in 6th, but behind him Morrow, Coath and Lynch put on a good battle for the minor placings. Holmes couldn’t recover to anything better than 10th. Millimetre perfect – no wonder he’s quick! Nathan Gotch shows us how it’s supposed to be done. Sunday morning’s conditions were again cool but clear, and all 13 cars lined up again for the second race. The first two rows were away clearly, with Goddard to the lead again ahead of Gotch, McAlpine and Wilson. Katsidis was away poorly, courtesy of a misfire that was to persist throughout the race, allowing the fast starting Coath to slingshot into 5th, ahead of Wlodek and Morrow. This trio were soon joined by two cars coming from further back – Holmes and Muddle, both eager to get somewhere nearer the back of Wilson’s car. However it was Wlodek that made the first move, getting ahead of Coath on lap 2, leaving Coath to defend against Holmes, with Muddle closing on Morrow. That move was made easier when Morrow looped it in turn 2 on lap three. Half a lap later the field was under safety car condition courtesy of McAlpine slowing to a halt – very unfortunate for him as the he was showing impressive cold-tyre pace. Not everyone saw the safety car sign, and there was a little bit of mayhem in the process, Holmes managing to make up a place unnoticed and Lynch managing to avoid the wrath of the officials by not quite completing a passing manoeuvre (even though it was recorded that way on the lap chart). At the restart it was Goddard Gotch and Wilson out in front, with Wlodek defending doggedly against Holmes, Coath holding position in front of Muddle and Lynch defending against Katsidis still firing on three cylinders. Lesslie, Morrow and Sviderskas were somewhere else, not quite on the back of the safety car train at the restart. Goddard managed the race well leading all the way to the flag, but the eventual gap was less than half a second, and Gotch again managed to get down into the 55’s to set the fastest lap. Wlodek managed to hold Holmes at bay for 5 laps, but was finally out-braked on the 11th of 12 laps to concede 4th place. This should have seen Holmes comfortably home, except that on the final lap the car inexplicably drove off into the sand trap at the final corner on the last lap. Outside the car that might have looked like Graeme once again testing the limits of physics with his braking, but inside the cockpit it seemed more like a jammed throttle. Either way, Wlodek was gifted 4th place. Muddle crossed the line a second behind him, having passed Coath but not without some effort. A good braking duel into the Fish-hook gave Muddle the place, but Coath made a strong attempt to regain the place under brakes At Turn 10. His challenge persisted all the way through Turn 2 and on the run back up the hill before the position was truly decided. This left Coath defending 6th from Lynch, which he managed to do, crossing the line a few tenths ahead. Katsidis held 8th from Morrow, recovering from his spin to finish 9th and the last car on the lead lap, with Lesslie improving his times by a few tenths in 10th and Sviderskas also making minor improvements in 11th. The trophy race over 14 laps was in cooling conditions on Sunday afternoon with all 13 cars again lining up for the start. The early order was Goddard from Gotch, Wlodek jostling with Wilson for 3rd ahead of Muddle, with both Coath and Lynch – noted good starters – looking for an opportunity. Wilson settled the battle for 3rd early in the opening lap, before Muddle also seized the opportunity late under brakes at the end of the back straight moving into 4th. At the end of the first lap Goddard and Gotch had once again opened a sizeable lead, from Wilson, with a gap to Muddle, and a further gap to Wlodek, with Lynch on his tail. Holmes was the best of the two rear-of-grid starters ahead of McAlpine, but no further progressed than 10h. While the front 4 cars were running steadily but with increasing gaps, there was plenty of action for 5th. Coath managed to take the place from Wlodek on lap 2, but Katsidis and Morrow were on a charge – both passing Lynch on lap 2, then both passing Wlodek on lap 3, before Katsidis took Coath for 5th on lap 4 with a deep dive under brakes at Turn 2. All this was frustrating the progress of Holmes and McAlpine who were still in 10th and 11th on lap 3, albeit having switched places. McAlpine disposed of Lynch and Wlodek on the following lap with before and after moves at the Fish-hook, but Holmes wasn’t quite as successful found the back of Wlodek’s car on the next pass lap at Turn 2, leaving Wlodek with a damaged rear wing and Holmes in the gravel, eventually leading to the deployment of the safety car. Lawrence Katsidis and a slight trace of tyre smoke got past Ron Coath in Race 3. When the safety car departed there was a 6 lap sprint to the chequered flag, with Goddard and Gotch going all out as they had all weekend. Goddard opened up a secure margin – a second – but they were both charging hard to the flag, setting their fastest times on the last lap and Gotch setting a PB and the quickest time of the race. Wilson and Muddle were close for most of the remainder, but each time Muddle closed the gap Wilson found something a little bit extra, and he pulled a comfortable gap over the last two laps to finish a well-deserved 3rd. Behind Muddle, McAlpine had found speed after the restart and steadily worked his way into 5th, courtesy of a series of late-braking moves at Turn 10, to finish ahead of Katsidis, with Coath holding out for 7th from the closely pursuing Morrow, and Lynch trailing in 9th. Lesslie finished two laps down but ahead of Wlodek, who despite a very non-aerodynamic set-up at the back of his car managed to circulate for points. Sviderskas unfortunately parked the Elfin with some (hopefully) precautionary concerns about the motor. With Goddard not racing for points, Gotch was able to secure full points for the second round in a row. 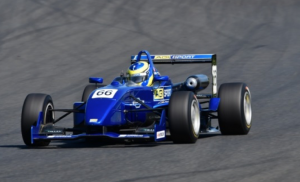 – A stellar debut for Ross McAlpine in ‘that French car’ (is it even a real F3 if it’s not a Dallara?Surely it can’t be), and the decision not to buy the mowing attachment with the rest of the spares was a good one. Ross was really quick, really smooth and really, really happy! About the only false move was inadvertently hitting the pit-lane speed limiter during Race 2, which brought that race to an early end, but everything else went smoothly. Of course ‘new car, new tricks’, and it an attempt to keep prying eyes away from all the aero Ross was parked up on pit lane instead of roughing it with the uncouth masses in the carports. A touch of l’arrogant frog? Certainly the injunction against any pictures of the car in this race report seems a step too far! (Actually we’d love to have some pictures of Ross’ car but our photographer has decided he only likes Dallaras – when your photographer is named Riccardo Benvenuti you can see how that might happen). “changed his entry” – but take a look at the table above: Phil Morrow is looking strong in the race for the Class Championship – six starts, six finishes, nothing to do between races but contemplate how quick he might be if only his crew remembered to bring the computer cable and he could access the data. – Wakefield Park: some people love it, some people hate it. And then there’s a small group of people that the track seems to hate back. Which brings us to Graeme Holmes’ disappointing weekend. Holmesy and helpers had a miserable time of it on Friday, having to replace a broken input shaft (the bumps on the back straight at Wakey can’t help), but by Saturday morning the car was ready to go racing. At which point the mystery brake problem that has plagued the car in recent times put an early end to the qualifying session. Race 1 provided no solutions but at least the car made it all the way to the chequered flag, but not at the speed to which it is accustomed. In the cockpit, no one can hear you scream. Sadly, only 4 of the cars in picture are still running with FRCA, a number of the drivers have upgraded to new equipment which is great, but what a pity we don’t have some of these cars still going around. Near the back (obscured) is Lynchy, and 2013 is probably the last time he was not the leading Pre-99 car in a pack (I think he was a rear-of-grid starter that day, he may have been unusually late to the circuit, there’s no other way he would be that far back). Garnet Patterson having set a sizzling pace in qualifying (56.14) cleared out that weekend to win the Trophy from the Darren Choon and Graeme Holmes (when the track loved him). 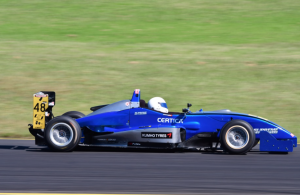 The 2018 NSW State Championship kicked off at Sydney Motorsport Park last weekend with F3 Premier Series contender Cameron Shields putting on a master class in the Gilmour Racing Dallara Mercedes F311. 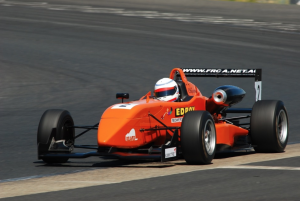 While the conditions were hotter than hot, Cameron barely raised a sweat in winning all three races, despite doubling up in the Formula Ford Championship (which he also won!). 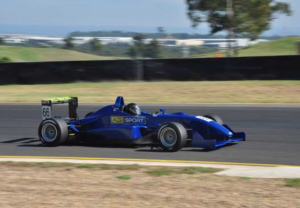 However with Cameron not contesting the State Championship, the winner over the weekend was returning 2016 Champion Nathan Gotch in the AGI Sport Dallara Renault F307, who picked up where he left off and completed the weekend with a maximum points haul. The mid-morning qualifying session saw temperatures already in the mid-30’s, and it was no surprise that most competitors produced their best times early in the session before engines and tyres got too hot. In less than ideal conditions Cameron Shields was within 0.3 seconds of Calan Williams ‘lap record’ (for State events) in the same car last July. Not only was it impressive, it was good enough by more than three seconds over his rivals. Nathan Gotch managed to secure a front row spot, narrowly ahead of Spike Goddard who was back in Australia from his international exploits and having his first run in a F3 car for several years, but clearly settling into the groove despite a lack of testing. Close on his heels the 2017 Champion Aaron McClintock was also in hot form, also qualifying in the 1:27’s but with much older machinery. Having seen the hot lap come up on the dash, Aaron parked the car knowing there was not too much more to be achieved. The third row spots on the grid were filled by the usual suspects – Graeme Holmes (GKH Powdercoating Dallara Opel Spiess F304) and Greg Muddle (Dallara Opel Spiess F399) – who qualified ahead of a trio of F307’s: Shane Wilson (Wiltec Dallara Opel Spiess F307), Andrew Wlodek (Dallara Honda F307) and Ron Coath (Dallara Mercedes F307). Shane Wilson’s weekend appeared to be over on Friday afternoon when he was bumped off the circuit by a sports car in practice and the right rear of the car was heavily damaged, but an overnight delivery of parts from Queensland and a massive effort by his support crew saw the car repaired in time for qualifying. Tenth place on the grid was the very familiar Eagle Transport Dallara Fiat F397 of Glenn Lynch, still motoring along rapidly with the longest continuous service engine in F3 history. The remainder of the grid was made up of a cluster of Dallara F304’s: Phil Morrow having his first outing in the ex-Gilmour Spiess powered car and Denis Lesslie having his first outing in the True Blue Trailers ex-McAlpine Renault powered car, both using this meeting to get familiar with the extra potential of their new kit; ahead of Lawrence Katsidis in the SYDNEY PHOTO BOOTH Dallara Renault F304 having its first outing back from an engine rebuild, and Rob Sviderskas in the Opel Spiess powered car, both of whom had problems in qualifying that kept them from their best. Brake issues saw Graeme Holmes pull out on the dummy grid and left us with 13 cars lining up in hot conditions – 60+ degrees on the asphalt. When the lights went out both Shields and Goddard got good jumps but Gotch bogged down slightly giving up 2ndplace. Muddle also got a good jump (something that couldn’t be said in any race report from 2017), keeping him in 4thwith Holmes missing and McClintock pulling off the track with what was to be a weekend-ending diff failure. McClintock’s departure was extremely disappointing as his practice times showed he was capable of mixing it with the later model cars ahead. Shields had already opened a sizeable gap on the first lap, a pattern that was to continue throughout the whole race. Likewise Goddard had a small gap on Gotch which he continued to stretch. Muddle led Wilson, Wlodek and Lynch, and behind them the order followed the fortunes of the start: Katsidis, who had repaired the problem in the gearbox that had relegated him to the back of the grid in qualifying made a good start, ahead of Morrow (who had jumped), Sviderskas, then Coath and Lesslie who had both stalled when the lights went out. Unfortunately, not much was happening in terms of racing – people were chasing hard but unable to close gaps. Morrow was the exception, taking a place from Katsidis on lap 2 and reeling in Lynch on lap 4. Coath had also made up some ground and passed Sviderskas on the same lap, but by that stage he had lost contact with the cars further up the field. Katsidis, after a slow start, was putting in some quick times and making up ground on Morrow, only to have the car stop on lap 7 as it ran out of fuel. Morrow was running strongly but was being haunted by Lynch, who wouldn’t let him go. Further up the field Muddle seemed to have a comfortable gap on Wilson, matching times lap after lap, but gave the spot away when he slowed with what was eventually found to be a loose air filter tube. When the chequered flag came out on lap 13 there were large gaps between almost all car – Shields taking the flag ahead of Goddard, Gotch, Wilson, Muddle, Wlodek, Morrow (although with a 5 second penalty he was subsequently relegated a place), Lynch, Coath and a fast closing Sviderskas in 10th, with Lesslie rounding out the field. Sunday morning saw no relief from the heat, if anything it was hotter, and 12 cars lined up for the first race. Holmes had managed to sort his brake issue, but we were without McClintock (diff) and Sviderskas (oil seal). Katsidis made a heroic effort to get to the dummy grid after replacing a flywheel, the second ‘car apart’ exercise of the weekend for the team. The first two rows made good starts Wilson shading Gotch but settling into a familiar order of Shields, Goddard, Gotch, Wilson as they completed the first lap, a pattern that was to stay in place for the remainder of the race. Muddle bogged down allowing the fast starting pair of Wlodek and Lynch to get ahead, and it wasn’t until he slipstreamed past Wlodek into turn 2 on lap 2 that he managed to get back to his starting position. Behind Lynch, Morrow settled into 8th, ahead of Holmes who was still checking out his brakes, then Coath ,who was again, uncharacteristically, slow away from the line and Lesslie. Unfortunately Katsidis pulled out early with clutch issues. Holmes was providing most of the entertainment as he progressed through the field, accounting for Morrow and Lynch on lap 2, Wlodek on lap 3, and then passing Muddle on lap 5. At that point there was still some hope of chasing down Wilson, but a spin at turn 2 on lap 8 put paid to that and gifted 5thplace back to Muddle. Wlodek, Lynch and Coath followed, with Morrow dropping a place due to fatigue (and having to deal with an unstrapped helmet!) and Lesslie completing the field. Where did all these cars come from? Race 3 and Shields finally sees some other cars. Having won the first two races by a convincing margin expectations were that Shields would do the same again in the final race. Eventually he did, but he made it slightly more difficult by stalling when the lights went out and falling to the back of the field. Despite this, he’d made it back to 5thby mid-way through lap 1, driving around the battling pair of Wlodek and Muddle between turns 4 and 5, and had found his way to the front by the end of lap 3, before driving to a 15 second win. With Goddard jumping to the early lead, Gotch edged ahead of Wilson and the fast starting Holmes, but Muddle again gave up places to Wlodek and Lynch off the line. He managed to reclaim these after passing Wlodek under brakes into Turn 15, enabling him to set out after Holmes. Lynch was close behind, having also managed to find a way past Wlodek on lap 2. Behind them Lesslie had made the best of the starts, to be ahead of Morrow, Coath and Katsidis, who unfortunately had no reward for all the effort on the clutch between races and eventually withdrew after 2 laps. With Shields clearing out there were several battles emerging: Gotch was unable to shake Wilson; Muddle was closing on Holmes; Lynch and Wlodek were inseparable; and Coath was chasing down Morrow and Lesslie, who traded places several times in the early laps. Behind Shields, Goddard had a relatively easy race to claim second. Gotch held out Wilson to claim third, but there was only a couple of seconds in it at the flag. Muddle was taking a few tenths a lap from Holmes until he tried to go a little bit too deep into Turn 2 and took an excursion onto the grass, after which he had to settle for a comfortable 6th. Lynch held Wlodek all the way to the flag, but there was only 7 hundredths of a second in it. Coath claimed 9th, and Morrow held on to 10thahead of Lesslie by just over a tenth of a second. “If I didn’t have bad luck, I wouldn’t have had any luck”. A deeply philosophical Loz Katsidis contemplates the combined effects of clutch, flywheel, gearbox pinion, frustrating fuel and 12 months out of the seat, and looks forward to burning some hot laps at Wakefield next round, with some luck. Despite all the conspiracy theories, 5 competitors survived targeted scrutineering without having their fuel bladders checked, and while the issue continues to hang there as a possible issue the early signs are encouraging: state scrutineers don’t appear to have had any instruction to enforce the rule. Greg Muddle spent a fair amount of time in the Clerk of Course office for having the loudest car in the category. Having tried the crossed wires at the end of the exhaust (they make 0.6 dB difference at Eastern Creek on a hot and humid day, for those who are interested) more radical surgery was required on Saturday evening. A large amount of stainless steel wool and some Kevin Lewis supervised re-engineering saw the car quietened sufficiently to compete on Sunday. As usual there were plenty of instances of FRCA members helping out their fellow competitors in their hour of need, but for simple brilliance in the “see problem, solve problem” department it is impossible to go past the appearance of Icy Poles after the first race on Sunday morning. Thanks Katrina, that was soooo good! As usual, there was plenty of talk about potential new cars – from Asia, from Italy, even from Victoria – and hopefully we’ll see at least one of these emerge in the near future. If you’re aware of anyone looking for a car then the ex-Robert Choon 01 is back on the market again in SA at a sensible price; and President Ross is aware of most of the other possibilities and might give you the tip (at least for the ones he’s not contemplating for himself). A big ‘Thank You’ from the Category Rep to all those competitors who booked garages as soon as entries opened, it was great having that settled so far in advance of the race meeting and not having anyone miss out. A successful first outing for Denis Lesslie, and putting it away in one piece is always good too. 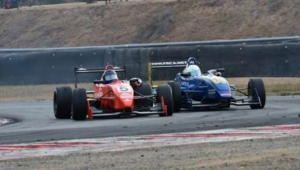 The final round of the CAMS NSW Motor Race Championships for Formula Race Cars saw Graeme Holmes give a masterclass in how to drive a F3 in the rain. With the GKH Powdercoating Dallara F304 Opel Spiess untouchable in the wet condition he put 3 race wins on the board to finish the season in style and clinch 3rd place in the Outright Championship in the process. Thirteen cars lined up on Saturday morning after Peter Warren’s beautiful March 82A BDA withdrew, having been rammed by a Radical on Saturday. 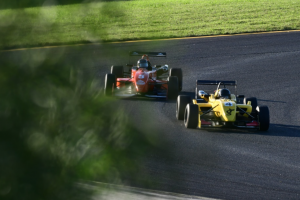 2016 Champion elect Nathan Gotch was an absentee and that opened-up the contest considerably, however it soon became apparent that pole would be a contest between Holmes and Rodney Brincat in the Glass Benders Dallara F304 Opel Spiess. Holmes had the early running, and both cars steadily improved their times throughout the session until Brincat posted a 1:31.45 on his second last lap, a time that Holmes was unable to better, although the margin was only a tenth of a second. Behind these two, Andrew Wlodek (Dallara F307 Honda) got the better of Ron Coath (Dallara F307 Mercedes) in the battle for Class D honours, with Coath in turn holding off Ron Bennett in the ARB Bundaberg Dallara F301 Spiess by a very thin margin. The “Two Ronnies” put on an epic battle last time out at SMSP and it looked set to continue. Completing the 3rd row was Kevin Lewis in the ‘FOR SALE’ Dallara F395 Toyota. Given that he was just going to run in the motor this was a fairly pleasing effort and the car looked promisingly quick. Lawrence Katsidis qualified the SYDNEY PHOTO BOOTH F304 Renault in a ‘safe seventh’ focussing his weekend on the points finishes required to clinch the All Classes championship. He was joined on the 4th row by a surprised Ross McAlpine in the Power Plus Fuels Dallara F397 Toyota – surprised because he fully expected to be a DNQ as a late arrival, only to find as he drove into the pit area that our session had been delayed and the rest of the cars were still sitting in the dummy grid. After a quick ‘Clark Kent’ into his driving suit, he was strapped in and drove out for 4 laps, and did enough to advance 3 rows on where he had expected start the race, and lead Class B into the bargain. Behind McAlpine was Rod Anderson (Reynard 893 VW), who was slightly off his normal pace but quick enough to qualify ahead of John English (Van Diemen FR97 FF2000) in the first of the Class A cars. Both the cars on the 6th row were struggling for pace, with Dave Morrow (Richards 201 VW AF2) edging out Phil Morrow in the Reynard 923 VW, who was hopeful the oil leaks that had plagued him in the previous round had been fixed, but Katrina had plenty of degreaser on hand just in case… and just as well. Rounding out the field for the weekend was Rob Sviderskas, who spent the session trying (in vain) to get his Dallara F304 Spiess to fire, and subsequently was forced to start from the rear of the grid. Race 1 on Saturday afternoon was run in clear sunny conditions and produced some excellent close racing. At the start Brincat had the better of Holmes off the line, but Bennet had the best of the start and made a strong surge around the outside as they headed through Turn 1, bettering both Coath and Wlodek. Katsidis was slow away from the line but made up spots in the Turn 2 scuffle, only to lose 6th place to Lewis with a ‘moment’ at Turn 5. As the started lap 2 it was Brincat leading with Holmes right up his exhaust, opening a gap to Coath, who had taken the spot from Bennet, who was pre-occupied with both Wlodek and Lewis up his pipes. Katsidis led Anderson, McAlpine and English to complete the top 10. Sviderskas was pressing hard and made it to 9th before retiring with what seemed like ‘death rattles’ in the motor but was later found to be a rather less costly exhaust issue. Holmes continued to hound Brincat and on lap 3 he managed to throw it down the inside at turn 2 as most people, including Brincat, expected – Holmes’ braking at that corner being both late and legendary. Brincat was not easily shaken however, and remained within striking distance for the remainder of the race. He quickly enough to set the fastest lap, and almost profited from a small mistake and lapped traffic to close within a car length on the last lap, but Holmes had enough in store to take the chequered flag. Coath lapped consistently in 3rd building up a gap on the three cars behind who were locked in an epic battle before coasting through the last couple of laps. Behind Bennet and Wlodek, Lewis was fighting hard to stay with the later model cars, and doing a good job of pestering them until he threw it into the gravel at turn 2 on lap 8. Lap after lap Bennet had his mirrors full of Wlodek, and when he wasn’t in the mirrors it was because he was alongside. On lap 6 the two cars were side by side through Turn 1 with Bennet holding the inside, and when they re-appeared in view through Turn 3 they were still side-by-side, a station they held all the way until they disappeared from view in the run up to Turn 6. Bennet held Wlodek for another 2 laps, but on lap 9 Wlodek again attempted a passing move at Turn 1 – this time on the inside. Once again the cars were still side by side all the way to turn 4, and Bennet looked to have again held off the challenge until he ran wide at Turn 9, conceding the position to Wlodek. While Wlodek pushed hard chasing Coath he had to settle for 4th, some distance ahead of Rod Anderson, who had spent a good deal of the race chasing down Katsidis in a battle for 7th and making spots late in the race with Lewis’ spin and Bennet also throwing it around at Turn 6 on the last lap, eventually recovering to finish 7th ahead of McAlpine English and Dave Morrow rounding out the top 10. Phil Morrow brought the Reynard home to finish but it wasn’t operating at its optimum. On Sunday morning the rain settled in quite decidedly, and the drivers prepared themselves for wet conditions. The field was reduced to 11 cars with Sviderskas’ car not repairable and Dave Morrow not having wets available. With all the ‘pit pundits’ in a upbeat mood (and why not? We didn’t have to go out in those conditions!!) the talk was the chance of an upset – the less power the better in these conditions and the two Reynards of Anderson and Morrow were highly fancied, along with the FF2000 of English on what looked like the newest and softest rubber in the field. At the start Wlodek got a great jump from the second row as Brincat and Holmes struggled to get away. He led the field through the first turn with Holmes chasing and a magnificent start by Phil Morrow saw him surging around a large number of cars on the outside. As they came back into sight at turn 3 it was Holmes, Bennet, Wlodek, and Morrow, up from 11th. Morrow rounded up Wlodek through turn 4 and would have quickly accounted for Bennet if he hadn’t thrown it away at turn 9, sending him all the way back to the rear of the field again. Over the line at the end of the first lap it was Holmes, already with a commanding lead, ahead of Bennet, Brincat and Wlodek, and then the not-at-all surprising pair of English and Anderson giving a good account of themselves in the wet. McAlpine led Coath, Katsidis and the recovering Morrow and Lewis pitted the F395 Dallara having decided his old tyres were not going to provide enough grip to keep it pointing in the right direction. With Holmes surging into the distance all the interest was in the minor places. Brincat followed Bennet around for a couple of laps before making his move, and after finding clear air he steadily opened a gap as he got familiar with how the F304 worked in the wet. Behind Bennet, Anderson managed to move up into 4th and looked quick enough to challenge Bennet only to have a lose at the right-hander at the top of the circuit on. By this time Morrow was on a charge again, despite some hairy moments off the track at Turn 1, and was entertaining the crowd with a superb drive. Having moved back into 6th with a bold Turn 1 pass on Wlodek on lap 5 he chased down English on the following lap to claim 4th the final car on the lead lap at the end of the race. English finished 5th ahead of Wlodek, who was clearly finding the F307 a bit of a handful in the wet, ahead of McAlpine and Coath. Rain again, and in fact more of it. By the end there were streams across the track so it clearly wasn’t great weather for racing and only half the field managed to get to the finish. Off the start Wlodek again got away well, as did Ron Bennet, and had brief claims to second place before Holmes got going, but it was Phil Morrow who once again looked quick and jumped to the lead. Brincat bogged down on the line and fell to the back, with all cars passing him except McAlpine who also failed to get away with the car suffering electrical problems. In normal circumstances McAlpine’s effort in rolling the car to the safety of the tyre barriers at the turn 1 run-off would have been laudable, however in these conditions it might have been a favour to everyone had he parked the car on the start finish line and brought out the safety car. At the front it briefly looked like we might have a race, with Morrow looking very quick, albeit behind Holmes at the end of the first lap, but unfortunately the Reynard aqua-planed off the circuit in the run-up to Turn 6, knocking the nose off the car and ending a season that was beset with problems, but sprinkled with glimpses of what Phil can do. With Morrow off, Holmes was left to an easy victory, completing a clean sweep for the weekend. Coath parked his car at the end of lap 1 with nothing to be gained in the conditions, and Anderson did likewise at the end of lap 3, having had a large lose in the same vicinity as Morrow’s car. Brincat made his way steadily through the field, eventually passing Bennet to move into 2nd on lap 5. 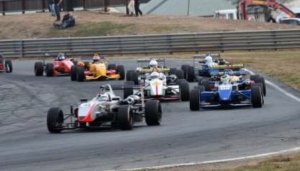 The other mover was English, who was doing a splendid job in the less powerful Van Diemen and had passed Wlodek before moving into 3rd place when Bennet spun on the last lap. Completing the finishers in a slow and lonely run was Lawrence Katsidis, who did everything that he needed to do to secure the All Classes Championship for 2016. Congratulations Lawrence! With 5 kills required to be an ‘Ace’ there must be a few new names going up on the Radical Roll of Honour this year. 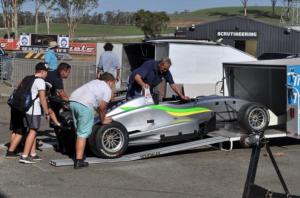 FRCA will be working closely in the off season with Ron Bennet to test the ARB Bundaberg prototype F3 bull bar kit to put us on a more level playing field, but until we can roll that out the best way to avoid Radicals is to make sure we put MORE CARS ON THE GRID each race meeting so that we don’t get lumped in with them in the future. That might require some people to show a bit more commitment, like not going skiing in the middle of motor race season if you can’t manage to do it without breaking a leg. Lynchy was there on Sunday to drum up some sympathy but after his brilliant wet quali on slicks at Goulburn it would have been better to see him on the right side of the pit wall. We need also need him back next year as our sole remaining active ’97 Dallara (plural, if he’d put Chris back in the other one) since the McAlpine car was sold not long after its Class B winning performance. Unfortunately it was sold interstate – unlike most recent departures its heading south rather than north but we’re unlikely to see it in our ranks any time soon. We are however expecting to see at least one new car next year, with a certain successful driver likely to appear in a Dallara F3 two-seater. The ‘Driving Miss Daisy F3 Champion Experience’ will be taking passengers on ‘hot’ laps laps at each of our rounds next year with a faithful replication of the 2:56.000 lap that sealed the deal. Just jealous, well done mate! 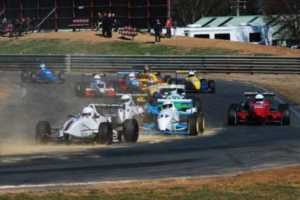 Wakefield Park The fourth round of the CAMS NSW Motor Race Championships for Formula Race Cars saw the cars back at Wakefield Park, where Nathan Gotch wrapped up this year’s championship and won the prestigious City of Goulburn Cup in the process. The Cup, inaugurated by F3 Management in 2015 when it was fought out in an intense battle between Ricky Capo and Jon Collins, was run in 2016 under the FRCA banner as Wakefield Park was not on the National Series calendar. Despite the small field – the result of a large number of regulars nursing broken cars, broken bodies, or both! – the racing was as exciting as always and Goulburn turned on its winter best to spice things up on the Saturday. Tim Berryman in the Dallara F308 Qualifying Saturday morning’s weather cycled repeatedly through the two available options: ‘cold’; or ‘cold and wet’. An early morning free practice session in the ‘cold and wet’ part of the cycle saw Tim Berryman (Ellery Motorsport Dallara F308 Mercedes) post the best time. The F308 was competing as an invited car for the Cup, but ineligible for championship points. Championship leader Nathan Gotch (AGI Sport Dallara F307 Renault) managed to park the car in the kitty litter before posting a competitive time, and that opened the opportunity for Phil Morrow (Reynard 923 VW) to show his credentials as best-of-the-rest in the rain and post the 2nd fastest time of the morning. When qualifying came around later in the day the weather looked to be clearing, before producing another shower as the cars sat up in the dummy grid. The two professional teams were always going to be well placed to make a last minute change but the rest of the field needed to make a call. So at the start of the session it was 50/50: Berryman, Gotch, Morrow, Shane Wilson (Wiltec Industries Dallara F304 Opel) and Rodney Baker, on debut in a Ralt RT30 VW AF2 car, all on the ‘option’ (i.e. wets); and the rest of the field on the ‘prime’, or in some cases on the ‘no option’ (i.e. slicks) as the cars sat on the dummy grid. As it turned out the session ended up having three red flags, so several competitors were able to arrange a mid-session change of tyres, but it was a session where almost everyone had an off, somewhere, with Lawrence Katsidis (Sydney Photo Booths Dallara F304 Renault) opening the proceedings on slicks spinning out of the fish hook and partly contributing to the first red flag; Berryman looping it an the top of the hill, ultimately bump-starting it in reverse but not before the second red flag; and Phil Morrow looping it at the final turn and parking it oh-so-close to the Berryman (again!) who had done the same thing moments earlier. At the end of a very entertaining session (if you were on the other side of the pit wall), Berryman had done enough between spins to edge out Gotch to claim pole by a tenth of a second. There was a fair gap to the rest of the field, with Wilson claiming third marginally ahead of Morrow. There was another sizeable gap back to Glenn Lynch (Eagle transport Dallara F397 Fiat), who had incredibly done the whole session on slicks, ahead of Baker, the under-powered Ralt seemingly more driveable in the wet than many of the F3’s. He may even have achieved 5th if the gaps between red flags had been a bit kinder. Katsidis, Ross McAlpine (Dallara F397 Toyota) and Ron Coath (Dallara F307 Mercedes) all changed to wets to at least post some sort of time and Andrew Wlodek (Dallara F307 Honda) battled through the session on slicks to round out the field. Although the rain had stopped the circuit was cold and slow to dry and this was reflected in the lap times, nobody finding any confidence-inspiring grip and only Gotch’s lap times breaking the minute. But although Gotch had the pace it was Berryman who had the better of the race, jumping to the lead and taking advantage of a poor-starting Gotch, with Wilson, Morrow and Lynch all passing him as the cars left the line. Baker held 6th briefly before McAlpine and Katsidis both fired down the inside into turn 2. By the end of the first lap Gotch had made his way back to 3rd behind Wilson, with Morrow, taking the strategic approach and starting on wets, being shuffled back behind Katsidis and Wlodek. By this time both McAlpine and Coath had spun, and the safety car was deployed. When things got underway again it was Berryman getting a jump on the field while Gotch took a lap to pass Wilson, and although Gotch closed the margin to under half a second in the closing stages Berryman looked in control for the win. Wilson led the rest of the pack for a couple of laps, with Lynch, Katsidis and Wlodek in a tight battle behind him and Morrow, who had managed to make a couple of places on the quiet at the deployment of the safety car, falling away on his wet tyres. Wilson looped it entering the main straight on lap 7, and that allowed several cars to move ahead of him, the Lynch-Katsidis-Wlodek battle as well as Morrow and Baker in the Ralt moving up to 7th. The battle for 3rd was the most interesting action on the track but Lynch had that in control to the flag ahead of Katsidis and Wlodek, with Morrow and Baker in the distance, the last car on the lead lap as both Wilson and McAlpine( with a late race spin) dropped a lap. Coath restarted but with only 6 completed laps was not classified. Better conditions greeted competitors in the middle of the day on Sunday, but it was still miserably cold for our feature race, the City of Goulburn Cup, over 18 laps. Somewhat controversially Berryman arrived at the dummy grid sporting ‘new boots’ and the Cup looked to be destined to continue its short but colourful history of litigation. Thankfully things were sorted out on the track. Berryman made another great start and Gotch, battling clutch problems, was again slow away from the line, dropping spots to Wlodek, Lynch and Katsidis. Wilson jumped up to 6th, ahead of Morrow, McAlpine and Baker, with Coath also having clutch problems again having difficulty getting away despite being penalised for jumping the start. Gotch needed to move early to have any hope of catching Berryman but was not having an easy time with the cars ahead, managing only to pick them off at a rate of one place per lap into the braking zone at turn 10. By the time he moved into 2nd place on lap 3 he was ten seconds behind Berryman and he set out determinedly to reduce the gap. Behind these two, Wlodek was busy defending his 3rd place, with Lynch, Katsidis and an increasingly frustrated Wilson all looking for a way around. Further back, Coath was the third quickest car on the track and quickly made up places passing Baker, McAlpine and Morrow, but possibly trying a bit too hard to make up lost ground managed to spin the car coming down the hill on lap 5, which brought out the safety car. The restart saw Berryman and Gotch closed up in the contest for the lead, and allowed the four cars battling for 3rd a bit of a breather. Baker was in 7th thanks to some problems with the Morrow car and a spin from McAlpine, and Coath was restarted but two laps down. When the safety car pulled away there was still 10 laps to go, and Berryman had the advantage of a lapped car between himself and Gotch. He used this, and some great defensive lines to hold out Gotch for four laps, before Gotch managed to go past the long way around on the outside at Turn 10. Gotch then proceeded to peel off a couple of 56 second laps to open a comfortable lead, before managing the traffic over the last couple of laps to take the flag with a margin of around a second. The battle for third was equally absorbing, with Wilson inspired to action at the restart and picking up a place a lap to move into third, posting some quick laps and opening up a sizeable gap. With the last lap board shown and Wilson being the last unlapped car he looked to have the minor place all but in the bag, but a momentary lapse of concentration at the ‘fish hook’ saw him turn the car around and, unable to get it moving again, gave up the place. This was all to the benefit of Wlodek, who had used every bit of that very wide Dallara (if you’ve ever been behind it you’ll know how wide it is!) to his advantage, driving a strong race to leave Lynch nowhere to go. Katsidis didn’t seem to have the same pace in the second half of the race, and despite hanging in there for a while trailed off behind Lynch in the closing stages. He was followed home in a respectable 7th by Baker who seemed to be coming to grips with the Ralt and put in some consistent laps despite a lack of company in the closing stages. Morrow had to pit when he was ‘meat-balled’ for some oil over-flow, having struggled with oil pressure issues most of the weekend, a disappointing result after a promising qualifying. McAlpine finished behind Baker a lap down as a result of his spin, and Coath retired before the completion with a slipping clutch. The final race of the day was a 10-lapper, and this time Berryman led start to finish. Gotch was again slow off the line giving up 4 seconds on the first lap. Despite posting the fastest lap of the race and closing to within half a second pressing for the win was secondary – the main assignment for Gotch was finishing, needing only a finish to secure the Championship with a round in hand – and so it was a very satisfied Gotch who crossed in second and sealing the Championship. Wilson again spent several laps trying to work out a way around Lynch and Wlodek, but had made his way through by mid race and opened up a sizeable gap. Lynch completed another 10 laps stuck to the exhaust of Wlodek’s car, but still could find no way around it and had to settle for 5th. Katsidis had an uncharacteristically poor start and after that couldn’t find the pace he’d had earlier in the weekend, eventually finishing 6th. McAlpine and Baker both had lonely races but Baker finished the weekend by improving lap times considerably. Coath again retired with clutch problems and Morrow decided to park the car while the engine was still in a state from which it could be rebuilt.  Plenty of interest in wings and slicks from some of the Formula Ford boys over the weekend, expect to see some new faces in 2017.  One ‘Forder’ who stepped up was Rod Baker, doing pretty well in the under-powered, under-cooled and wrongly-geared Ralt. One thing it wasn’t was underweight, Rod having taken the precaution of loading up 25 kilos of kitty litter on Friday (and then topping it up on Saturday for good measure). Good thing Team Muddle knows a thing or two about cleaning. With the Outright championship wrapped up, interest moves to the minor places. Andrew Wlodek has a tight grip on 2nd, and Lawrence Katsidis looks fairly comfortable for 3rd, although 3 wins for Holmes might make it interesting (that’s possible) as would another car magically appearing in Muddle’s garage (that’s unlikely). In the Class Championship Lawrence has a strong chance of overhauling Gotch for the championship, but Gotch looks likely to hold at least second (unless there’s an influx of late model cars Andrew Wlodek is probably limited to a further 45 points, leaving him agonizingly short). Should anything untoward happen to Andrew there are several drivers with a mathematical chance of snatching 3rd place from Wlodek or Al Palmer. The third round of the CAMS NSW Motor Race Championships saw Formula Race Cars return to the traditional Brabham Circuit layout of Sydney Motorsport Park, and across an eventful weekend, where drivers had to overcome poor weather and misadventure, Nathan Gotch in the AGI Sport Dallara F307 extended his series lead with a convincing victory in the trophy race after starting at the rear of the grid. A field of 15 cars were entered for the weekend, which included the return of Glenn Lynch after missing round 2 and the first appearance for some time of Peter Lucas (Ralt RT4 Formula Atlantic) and Edward Gavin (Cheetah Mk.8 AF2) both giving their cars a shakedown for the June historic meeting. After months of unseasonably warm and sunny weather Saturday morning cold temperatures and ominous clouds, which produced drizzle on cue as the first cars rolled out for the opening practice session. By the time Formula Race Cars took to the track it was full wet conditions. Gotch had taken pole with clear margins in both previous rounds but on this occasion he was soundly beaten for the honour by Lucas, using the big rubber and softer chassis of the Ralt to good effect, with a massive 8 second gap and the only driver to break the 2-minute mark. Gotch had to settle for 2nd ahead of Graeme Holmes (GKH Powdercoating Dallara F304 Opel Spiess) and noted rain master Ron Bennet (ARB Bundaberg Dallara F301 Opel Spiess). Rod Anderson (Reynard 893 VW) was the first of the Cup Class drivers, with Rob Sviderskas, another driver who usually performs well in wet conditions completing the third row. The remaining qualifiers in order were Glenn Lynch (Dallara F398 ‘the Gold Car’), Rodney Brincat (Glass Benders Dallara F304 Renault), Ross McAlpine (Power Plus Fuels Dallara F397 Toyota), Andrew Wlodek (Dallara F307 Honda) on borrowed rubber and Ron Coath (Dallara F307 Mercedes). Lap times reflected a very tentative approach to difficult conditions, with only 11 cars qualifying, Greg Muddle (Dallara F301 Opel Spiess) having an altercation with the inside wall out of turn 18, Al Palmer (TOMS Toyota) and Edward Gavin choosing to sit the session out (is it a black car thing?) and Lawrence Katsidis (SYDNEY PHOTO BOOTH Dallara F304 Renault) not having brought any wets to the circuit. Although the rain had stopped the circuit was slow to dry and the ‘slicks or wets?’ decision was resolved for most only a matter of minutes before cars proceeded to the dummy grid. In the end everyone apart from Sviderskas and Katsidis elected to use slicks, and as the minutes passed on the dummy grid, under sunny skies, waiting for the previous race to be cleared, the dry tyre option seemed to be the right choice. The long wait also gave AGI the chance to address a very three-cylinder sounding Dallara before the cars rolled out. The warm-up lap proved to be the most eventful of the race, with both F301’s not making it to the grid, and while it looked dry the conditions remained slippery. Muddle’s car, repaired from its morning misadventure, suffering electrical problems; and Bennet lighting up the rear tyres on a slippery track and finding the wall on the run out of turn 15. Cars were delayed on the grid and when they moved away for a further warm-up lap Sviderskas also parked his car with electrical problems. Eventually the race started, and although most observers expected Lucas to use his big rubber to full advantage he managed to put too much power down and consequently both Gotch and Holmes were able to jump ahead off the line. Wlodek made a blinder of a start from the 5th row and as the lap unfolded found himself in 4th, ahead of Brincat, Anderson and Katsidis surging through from the rear of the grid, the soft tyres proving helpful at this stage. Brincat passed Wlodek for 4th on lap 2, and from there the top 6 settled for the remainder of what was a shortened race – only 4 laps in total with the time lost recovering Bennet’s car. Gotch opened up a gap on Holmes, and the gaps between the following cars also extended across race distance. There was more interest in the back half of the field, with Katsidis on the back of Anderson in the early part of the race before starting to struggle with tyres, and Coath making steady progress through the field to pass Katsidis for 7th on the final lap. Lynch soldiered on to 9th with a car that was running on less than 4 cylinders at low revs, ahead of McAlpine and a very cautious Al Palmer who hadn’t had the opportunity to scrub in tyres earlier in the day. Edward Gavin retired from 10th position earlier in the race with gear selection issues. All 15 cars left the dummy grid for race 2 on Sunday morning, in perfect conditions and, almost surprisingly given the previous days effort, all 15 made it to the start, although Katsidis and Lynch both tried hard with spins on the warm up lap. Repairs to Bennet’s car and a change of car for Lynch to ‘Old Faithful’ (or ‘the Yellow Car’) were the main overnight developments. At lights out it was Holmes getting the jump on Gotch and leading into turn 2 where, unfortunately, all hell broke loose. Lucas in the RT4 was caught out by how early the cold-tyred Formula 3 cars were on the brakes, and ran into the back of Gotch, who in turn clipped the back of Holmes’ car. The big lose in all of this was Brincat, who had nowhere to go and launched off the wheel of Gotch’s car into the kitty litter. While Holmes and Lucas were able to run their damaged cars back to the pit Gotch’s car was immobilised by the contact and Brincat’s had sustained heavy damage bringing out the safety car. When the smoke cleared (and that wasn’t until most of the rest of the field were well past turn 2), it was Rod Anderson leading the pack, ahead of Coath, Bennet Palmer and Wlodek. Racing recommenced on lap 5, and with Anderson baulked by the safety car he conceded places to Coath and Bennet. Wlodek quickly rounded up Palmer, and then moved into 3rd when Anderson spun out at Turn 16. Behind Palmer it was McAlpine running strongly in 5th until he experienced drive issues and parked the car. At the front of the field the two Ronnies were engaged in an intense battle with Bennet gaining the lead at the end of lap 5 only to concede it on the following lap. Coath was able to hold him out for the victory in a race shortened to 7 laps by the safety car period, and Bennet maintained second ahead of Wlodek, who was the fastest car on the circuit by some margin, and may have challenged for the lead had the race been a lap longer. As it turned out the three cars were covered by three-quarters of a second as they crossed the line. Behind the front runners, Muddle battled hard to find a way past Sviderskas and was finally able to do this on the last lap, before chasing down Palmer to claim 4th place. Palmer was able to hold out Sviderskas, Lynch, and Gavin in the Cheetah, all in close quarters. Katsidis had trouble coming to grips with tyres and rounded out the finishers in 9th place. A reduced field took to the track for what promised to be an interesting feature race, with the two quickest cars starting at the rear of the grid. Brincat, Lucas and McAlpine were all missing with unrepairable issues from the morning’s race. The front three cars goat away from the line well, but Muddle struggled and was locked in a battle for 4th in the run down to turn 2. Palmer made contact with the rear of Muddle’s car turning him around and parking him the wrong way around in the middle of the corner, which created difficulties for the rest of the pack and a disadvantage for those who had to go the long way around, including Sviderskas, who got a little bit of contact for his troubles. The big winner in all of this was Gotch, who found a clear way through the melee and was up to 3rd by the end of the first lap, making it an all-07 top 3 for the first time: Coath, Wlodek and Gotch as they went past the start/finish line for the first time. Bennet followed, then Palmer, who managed not to drop a spot from the turn 2 incident, Lynch, Holmes, Katsidis, Gavin and Anderson, who had dropped places on the first lap. Gotch was comfortably in the lead by the end of lap 2 and working on opening up a big margin on the rest of the field and earning an ‘R’ next to his name in Natsoft (although my records indicate that he has done a quicker lap that that in the old ’04). Behind Gotch however there was plenty of battling over places, with Holmes being the big mover through the field, passing Palmer and Bennet on lap 2 and then chasing down Coath on lap 7, before setting out after Wlodek. Wlodek and Coath had been locked in their own battle for 2nd for the first 5 laps, but once ahead Wlodek had set a strong pace and had opened up a sufficient margin to hold out Holmes at the finish, although at 0.3 seconds it was probably a good thing the race didn’t go a lap longer. Coath finished in a lonely 4th, but behind him Bennet had his hands full defending 5th from Lynch. Both of them had been backed up behind Palmer for most of the race, who had defended 5th for the better part of 8 laps. At the end there was only half a second between Bennet and Lynch, and the gap had been barely more than a second for most of the race. Behind Palmer, Katsidis rounded continued his disappointing form for the weekend but collected valuable points, and Sviderskas was unable to recover positions after the first lap incident. Gavin retired early in the race; Anderson also retired with some strange noises at the rear of the car; and Muddle, having chased down Sviderskas by mid-distance, retired soon after with a very cranky sounding Dallara that was tired of being treated so poorly. So, in a weekend of upset results and DNF’s what happened with the points? Nathan Gotch 40; Andrew Wlodek 40; Ron Coath 39; Graeme Holmes 30; Ron Bennet 26. Glenn Lynch 41; Al Palmer 41; Graeme Holmes 40; Lawrence Katsidis 40, Ron Bennet 36. Nathan Gotch 160; Andrew Wlodek 100; Greg Muddle 92; Graeme Holmes 78; Ron Bennet 73. Al Palmer 127; Nathan Gotch 126; Greg Muddle 118; Ron Bennet 104; Lawrence Katsidis 104. On Sunday it was more a case of short outbursts, with the Race 2 mayhem leaving a few people out of sorts. Unfortunately most of the damage centred on Rod Brincat’s car, but it’s not in Rod’s nature to make a song and dance about things and he handled the disappointment in a way that’s a credit to him and a lesson to the rest of us. Hopefully it’s not too lengthy a stint on the sidelines and the FRCA competitors can lend assistance where able…. As they demonstrated across the weekend, with spare starter motors, suspension bits, tools, know-how, and magic bending skills shared freely across (cramped) garages in the interest of getting cars back on the track (where they could sustain even more damage… (sorry, that’s not the attitude!). Thanks to all who help out so regularly. Re the reference in the above to cramped garages, it (sort of) worked out in the end, but it will be A WHOLE LOT EASIER if all drivers could put their entry in AS SOON AS ENTRIES OPEN to make sure we get the number of garages we need. The current approach to finding you all a space requires a master’s degree in logistics (or magic) and will not work if we get a proper-sized field of cars, and especially at the September SMSP round garages spaces will be at a premium. Friday practice saw a new development in the professional side of FRCA: test drivers. AGI Sport rested their contracted lead driver in favour of giving their designated test driver a seat (although they skimped on the actual ‘seat’, Nick having to modify his F4 seat mid-way through the day) and the boy ‘done good’ (despite occasionally buzzing the engine J). Rumour has it we’ll see Nick again in a F307 soon….. It would be good to see other teams following the AGI example and giving some potential talent some seat time. Team Muddle is looking at options (if there’s anything left to break on the Dallara the Fabulous Baker Boy may as well break it, since the team principal has done enough damage already); Team Eagle Transportation probably needs some re-education (Testing: that’s a 2nd drivers in the car, not a 2nd car for the one driver) but it seems like Chris has been benched since he set better times than the lead driver at the Summer Shakedown; at Power Plus Fuels Team McAlpine they have the capacity to run a second car, and a lighter driver in the F398 might fix that ride-height issue they seemed to be having; and at SYDNEY PHOTO BOOTH, we know they’ve been advertising for an interstate driver (hence Rick’s relocation to Melbourne). Next Round is at Wakefield Park in August, we promised some big news about this race meeting and hope to announce it soon. Stay Tuned. 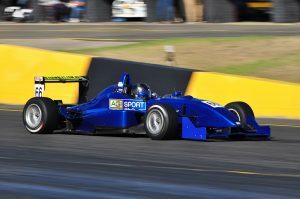 The second round of the CAMS NSW Motor Race Championships saw Formula Race Cars competing at Sydney Motorsport Park on the Gardner Circuit, and for the second successive round Nathan Gotch proved unbeatable in the AGI Sport Dallara F307 – taking pole position, scoring three race wins and setting a lap record – and in the process establishing a commanding lead in this year’s championship. Qualifying A field of 15 cars were entered for the weekend, including Rodney Brincat having his first championship run in the Glass Benders Dallara F304 and the Mexican Troika of Graeme Holmes, John Boothman and Rod Anderson making their first trip north for the year. From the previous round we were missing Glenn Lynch – can we have a FRCA round without Lynchy? I’ll have to check the constitution, it’s a totally unprecedented situation and frankly it unsettled the meeting and we hope the situation is restored to normal soon. Also missing was Richard Scarcella, still to complete the repairs on his F307, as well as Nick Fillipetto’s F304 which has been sold and will be travelling north to Queensland, hopefully not to a sunny retirement. Qualifying was dominated by Gotch, who set a time of 1:47.75. That wasn’t to be bettered all weekend and was and almost a full 5 seconds ahead of the rest of the field. Clearly we all have to lift our game to keep Nathan in sight! Behind Gotch things were more competitive, with Aaron McClintock setting a very respectable time in the 1:52’s to take the front row spot in his Dallara F301 ahead of some later model cars. 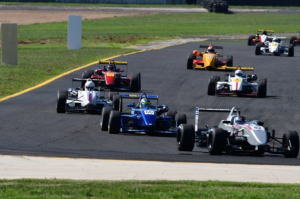 Holmes and Brincat filled the second row in their F304’s setting times in the 1: 53’s and shading Greg Muddle (Dallara F301) and Andrew Wlodek (Dallara F307) who both had times in the low 1:54’s and filled 5th and 6th respectively. The 4th row was occupied by Boothman and Ron Bennet in a pair of red Dallara F301’s, ahead of the first of the Cup Class cars of Ross McAlpine (Dallara F307) and the slightly hot-under-the-collar Reynard 923 of Phil Morrow who started the weekend chasing water problems but managed to qualify 10th. Rod Anderson (Reynard 893) and Rob Sviderskas (Dallara F304) qualified 11th and 12th respectively, Sviderskas having to make the most of some inadequate gear ratios. Al Palmer had some rear wheel issues that hindered his qualifying efforts in the TOMS Toyota F036, whilst Ron Coath continued to endure the difficult task of coming to terms with his Dallara F307: immediately post qualifying you could have picked up a F307 quite cheaply, Ron having again battled gremlins on Thursday and Friday that robbed him of valuable seat-time. Whilst the rest of the field was on track qualifying the Sydney Photo Booth Dallara F304 of Lawrence Katsidis sat forlornly in the garage with its gearbox strewn all over the floor with Rick performing major surgery and Lawrence undertaking the Herculean task of ensuring Rick put all the pieces back in the right order without getting distracted. Hot and sunny conditions for the drivers in what would eventually be an 11-lapper (time certain races always leave us guessing) for a full field of 15 cars. McClintock had the jump off the start and managed to hold that lead all the way to turn 2 when Gotch restored order. Wlodek briefly pushed his way into third ahead of Holmes with Muddle (bad start) Brincat (worse start) and Anderson (sideways!) being the big losers off the line. Boothman made the most of this to briefly claim 5th, whilst Sviderskas moved from 13th to 9th, a position he’d hold throughout the race. Once the early jostling was out of the way the order was Gotch, McClintock, Holmes, Wlodek, Muddle, Boothman, Brincat, Bennet, Sviderskas and McAplie in tenth, leading the Cup Class. Lap 2 saw McClintock retire with a loss of power, which proved to be a blown head gasket and would sideline the car for the rest of the meeting. The following cars all moved up a position but while Gotch and Holmes started to open up margins that would grow over the length of the race there was a good battle between Wlodek and Muddle for 3rd and Brincat putting pressure on Boothman for 5th. Muddle had several attempts to pass Wlodek and eventually was successful into turn 4 on lap 4. By that stage Brincat had passed Boothman and had latched onto the back of Wlodek and was also able to make his way through later on the same lap. With Wlodek’s car cleared he set about chasing down Muddle, and was able to move into 3rd place with a tow down the straight on lap 8. Wlodek and Boothman meanwhile had maintained good pace, and the gap to Muddle closed over the remaining laps such that there was very little between all three cars as they crossed the finish line. Rod Anderson followed in 10th, the first of the Cup Class cars, having a busy race after his poor start dropped him to the rear of the field. McAlpine had led the Cup Class in the early stages before being passed by Palmer and Morrow on lap 2, and then having a moment on lap 4 to put him out of contention. Anderson meanwhile plugged away with consistently quick times that enabled him to catch and pass Morrow on lap 7, and then chase down Palmer on the last lap to claim the honours. Morrow crossed the line in 12th behind Palmer nursing the overheating car home, and McAlpine followed with his car sounding like farm machinery. Coath completed the finishers, but with a significant improvement in lap times and a far happier driver than we’d seen earlier in the day. Sunday morning brought warm and sunny conditions again, and 14 cars lined with McClintock the only car missing from the field. Holmes got the initial drop on Gotch – that didn’t stop the officials giving Gotch a false start penalty of 5 seconds – but the order was soon restored and Gotch again drove away from the rest of the field, albeit in marginally slower that the day before. Wlodek made a good start from 5th to move into 3rd, ahead of Brincat, Katsidis, Bennet, Boothman and Sviderskas, with Muddle dropping from 4th to 9th with another poor start, and Coath making a promising jump to 10th. With the front two cars again clearing out, the early interest centred on Brincat trying to find a way around Wlodek for 3rd place, and Muddle trying to work his way back through the field. Brincat eventually made his way through with a tow down the main straight on lap 4, and although by that stage the gap to Holmes was too big to bridge he did manage to pump out faster lap times in the closing stages. Muddle had managed to pass Sviderskas on the opening lap, and was up to 6th at the end of lap 2, but then had to work his way past Katsidis and Wlodek to get back to the position he started from. By the time he was there he needed a telescope to see Brincat at the other end of the main straight. 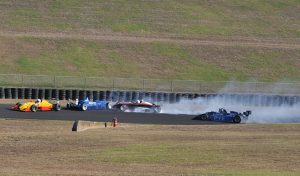 The cars behind Muddle were in close proximity – Wlodek, Katsidis, Bennet – and Bennet was able to make the best of Muddle moving through the field, passing Katsidis and Wlodek on the following lap in each case. Only a brief excursion to the grass exiting the new section of the track stopped him putting more pressure on Muddle in the closing stages of the race. Wlodek kept pressure on Bennet to the end ahead of Katsidis, Boothman and Sviderskas, with gaps between each of these cars opening consistently over the closing stages of the race, and Sviderskas in 9th being the last of the cars to complete the full number of laps. Coath followed in 10th – or in 1st as by some strange reckoning he was the first car to be shown the chequered flag, exploiting the tactical advantage of having a blue F307 (they all look the same) –having held position throughout the race and having dropped his lap times by some further margin. Clearly the light at the end of the tunnel was getting closer (and it no longer looked so much like a locomotive). In the Cup class McAlpine had again made a promising start and again had a mid-race moment, the F397 not offering the arm-room, leg-room or aero that Ross has become accustomed to. Anderson had moved into the class lead on lap 3, ahead of Palmer, his car improving but still not handling to his liking and Morrow rounding out the field. The field was down to 11 cars for the Trophy Race, with McAlpine and Morrow both out with drive issues and Boothman jumping the start by so much that he was 100km down the Hume Highway by the time the cars rolled out (probably looking to get some secret test laps in at Wakefield Park while we were all otherwise ditracted). The race quickly settled into a familiar pattern – Gotch first daylight second; Holmes following; Wlodek getting out of the traps quickly (but not fast enough to jump Brincat this time); and the rest of the field engulfing a poor-starting Muddle. By the end of the first lap the top 3 had settled with Brincat in 3rd and those three opend up consistent gaps for the remainder of the race, with only a brief moment for Brincat on the penultimate lap upsetting the pattern. Behind them, Wlodek led Bennet, Muddle and the fast-starting Coath ahead of Palmer, Katsidis and Sviderskas, with Anderson bringing up the rear. Muddle worked his way past bennet on lap 2 and then had a race-long struggle with Wlodek – which pretty much looked the same as the race-log struggles they had in the previous 4 races this season – with Wlodek able to hold out Muddle quite effectively to take 4th place. Bennet had good pace early in the race making this a three-way contest, but tailed off in the closing stages. Coath had made a flying start off the line and was in 6th at one stage, but settled into a consistent run behind Bennet, but with sufficient pace to hold Katsidis behind him, the later having to spend the opening lap behind Palmer. Sviderskas also found himself back in the pack and under threat from Anderson who was able to take position on lap 2. The three cars – Palmer, Anderson and Sviderskas – provided the most interest in the race, never more than a second apart over the journey and only three tenths separating them as they crossed the line. The only car failing to finish was Katsidis, who managed to spin the Dallara coming out of the tight hairpin 2 laps from home and was beached on the ripple strip. Nathan Gotch 60, Graeme Holmes 48, Rod Brincat 42, Greg Muddle 34, Andrew Wlodek 30. Graeme Holmes 60, Rod Brincat 48, Nathan Gotch 45, Al Palmer 43, Greg Muddle 42. Greg Muddle 102, Nathan Gotch 96, Al Plamer 86, Ron Bennet 68, Ross McAlpine 65.